1) Went to Circuit City, used $40 off coupon to get Xbox 360 HD-DVD player for $160. 2) Came home, opened box of Xbox 360 HD-DVD player. 3) Plug in USB for HD-DVD player to PC USB port. 4) Plug in power for HD-DVD player to powerstrip. 5) Windows XP automatically recognizes HD-DVD player as XBOX 360 HD-DVD Player and Toshiba HD-DVD ROM... no hacked drivers required. 7) Insert HD-DVD movie disk. The 360 HD-DVD player came with King Kong, but I also purchased "Fearless" with Jet Li. 8) Hit play on PowerDVD 6.5. Optional: I also installed the Toshiba driver hack, and I'm able to just drag and drop the whole contents of the HD-DVD onto my hard drive. Granted it takes up about 30GB of space, but this is an easy way to make backups. These are my legally owned movies, and as far as I know, this is perfectly legal. I'm running a HDCP compliant video card and monitor for full 1080p playback, but I have not tried this with analog or anything else. I think it might downscale your playback, but I'm unsure. LOL I love it !!! That is way too kewl !!! I wonder ... if you have a video card that supports HDTV out via DVI etc. then can you hook up the computer to your HDTV for 1080i playback? Is there a reason for using PowerDVD 6.5 as opposed to the newest 7.0 version? hmm.. well, HD-DVD's are 1080p. I don't know why you would want to do a conversion and interlace or downscale. But, I suppose it could be done if you hook it up that way. 720p would be a better way to do it since 1080i usually looks bad when you hook up a computer outputting that way. 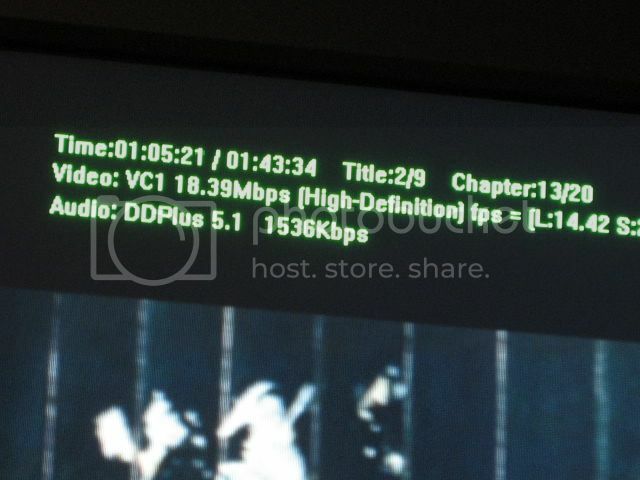 If you have a TV set supporting 720p and 1080i, its native pixel resolution is going to be 1366x768, or 720p. There's no sense in running a higher interlaced resolution that will look fuzzier on a PC output. But, whenever the HDCP disks come out, you won't be able to do that because you would need a solid HDCP connection on both ends which is 1080p, or else your video is downscaled to 480i/p. hmm.. well, HD-DVD's are 1080p. Well I understand that HD-DVD supports 1080p but my HDTV has a native 1080i resolution. Hence I said 1080i instead of 1080p. Now my HDTV will accept 720p but will rescale internally to 1080i so I figured it would be best to feed it 1080i to start with although if the computer will output 720p "better" than 1080i then I suppose you have a point ... assuming that is true. Not sure I buy into that just yet without some back-up though. Please excuse my ignorance, but my gaming years happened when Atari and Coleco were at the top of the heap. You're saying you can buy an XBox 360 HD-DVD player and connect it to your PC and play HD-DVDs? As mentioned, you should then be able to connect this to your HD TV and have an HD DVD player. Am I grasping ths right? Do I need an XBox 360 console? You are grasping this right. No. HD-DVD's are 1080p. It says right on the retail box of the disks, and it plays back in 1920x1080 progressive. Native 720p resolution, as in 1366x768 pixels, but it will do 1080i upconversion internally. You would want to output from your PC at 720p. If you wanted 1080i, you would have to run 1920x1080 at 30hz, assuming you TV would even accept the signal. I'm not sure this makes sense. My HDTV displays at 1080i or 540p ... end of story. It will accept 480i, 480p, 720p and 1080i but really everything gets displayed at 1080i (I don't understand why they even included the 540p setting and the model after mine is nearly identical but dropped that 540p mode). In short my TV will accept 720p but since it only displays at 1080i I wouldn't call 720p the native display resolution. Just hook it up to a PC and try outputting 1920x1080 and you'll see what I'm talking about. I have Hitachi HDTV that has the same resolution as yours: 1080i or 540p with native resolution of 1920x1080i. It will accept 480i, 480p, 720p and 1080i and can show at that resolution, but I keep everything at 1080i (no use for 540p). 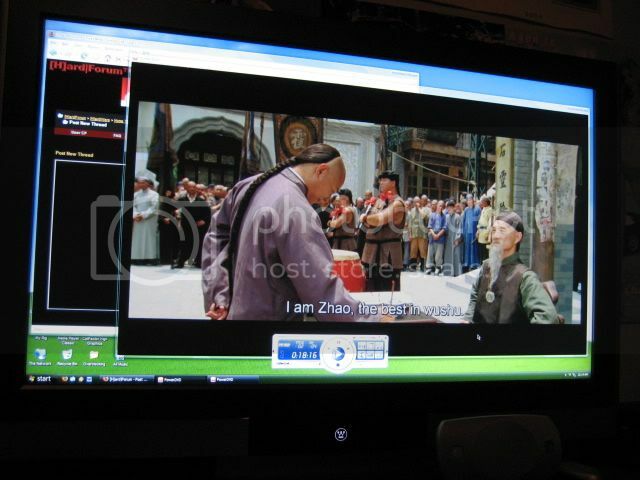 I have HTPC with ATI X1300 Pro video card that connected to my Hitachi through DVI-to-HDTV (component) adapter. I keep resolution of my HTPC at 1920x1080i at 30MHz. And I don't think you would want to set you r resolution to 720p. I have no problem using my HTPC with my Hitachi HDTV at 1920x1080i at 30MHz. as I understand it (I own the hardware in question as well), it is POWERDVD that is a bit of a limitation. 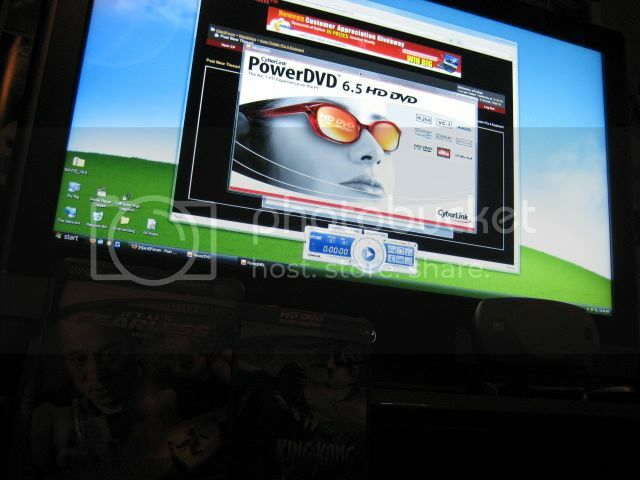 EVEN THOUGH no HD-DVD discs use the downscale flag (if not HDCP) yet, PowerDVD will only playback an HD-DVD at full resolution IF the videocard AND monitor support HDCP. This is a bit annoying as that is not yet required by any movie (though the option is in there for this). Using the XBOX 360 with the HD-DVD player and an HDTV or PC Monitor and you will not have this same problem. The 360 via Component and via VGA will spit out a 1080p signal. I've followed this closely via AVSForums and on other sites. Be warned if your monitor is not HDCP compliant, powerdvd is not the way to go. So do you need a HDCP video card and monitor? I plan on getting a DELL 2007WFP 20" LCD with 1680x1050. No mention if it is HDCP though. Would it work, and waht resolution would the movies playback at? The dell 2007 is HDCP compliant as is the 2407. The 3007 is not. HDCP is not supported over a dual-link DVI connection, so currently all monitors over 1920x1200 are a bit screwed in that regard. You would need an HDCP compliant video card... certainly. You have no idea what you are talking about. The 3007 does support hdcp. Hdcp is supported over dual-link dvi. 3007wfp specs >>> "Ports: DVI-D (dual link) with HDCP"
I don't think DVI is HDCP, and I doubt my Dell monitor is HDCP compliant. I set everything up and it tells me "This content is protected and this system is not able to playback this content". So unless you have a HDCP system, don't bother with this setup. Dang it! I tried this when I got it for my Xbox for Xmas- but it didnt work with PowerDVD 7! Is 6.5 the only one with HD DVD Compatibility? I asked earlier if there was some special reason for using PowerDVD 6.5 as opposed to the newer 7.0 version but nobody ever answered that question. The new 7.2 Ultra supports HD, both Blu-Ray and HD-DVD. Only the Ultra version however, not the standard version. Also, I believe you have to have a HDCP Video Card and Monitor, not 100% sure. I need to recheck where I read that. I think the issue may then have been that you couldn't upscale the image beyond 1920x1200 and since the 3007 monitor has no internal scaler of its own, you end up stuck looking at a smaller picture than your screen can otherwise show. Anyone have this to try it? jg001, i'm sorry, i owe you and the board an apology, what you said was kind of correct. the issue with hdcp over dual-link dvi...you need a video card that supports hdcp over dual-link, which i havent been able to find. so until those come out, yes you are right, dvi connections at dual-link are screwed. There are many links to stories on HDCP and video card compatibility. The end-story is that there are none currently, unless you buy a "media center" ready PC. I had upgraded from PowerDVD 6.5 to 7.2. The problem I have is that the 7.2 tells me that my system is not HDCP compliant, specifically the latest ATI driver for 9800 pro is not compliant. I did not have that problem with the 6.5. So I downgraded and am watching HD again with a little stutter. What I know is that it does not take that powerful of a system to run HD. There is a video on youtube that a guy had taken the HD_DVD player apart and found that it was using a 2.5 ghz chip to run HD. I do not know if it was a P4 or a dual core. Is there a 2.5 Ghz dual core chip? What do you think. Someday, someone will offer a better solution for sure. That make me think that all the extra CPU is purely for HDCP compliant/protection. Now that title keys are freely available online at http://hdkeys.com/ , I was hoping someone could pass on instructions as to what is necessary to play the HD-DVD titles off of the hard drive. Does PowerDVD 6.5 load the title directly off the hard drive or do you have to create some sort of iso file? 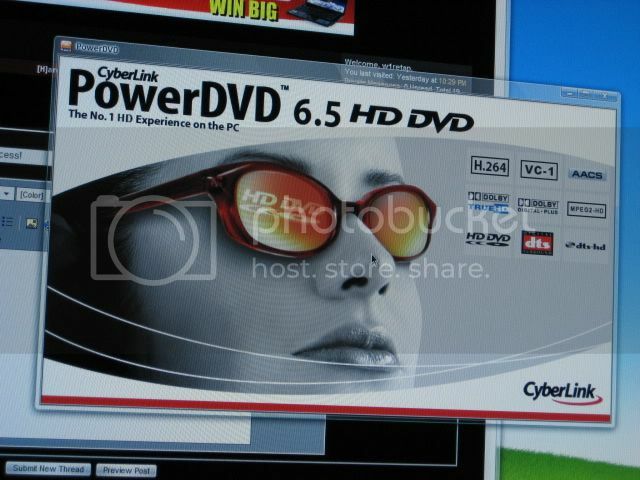 I have PowerDVD 6.5 but not an HD-DVD drive. However, there is an option in PowerDVD to play HD-DVD from the hard disk, just like there is an option to play DVD from the hard disk. I have not personally tested this with any HD-DVD material, but it should work. Anyway, I don't think you can create ISOs as I'm not aware of anything that will do that. Thanks for the reply. I will check this out over the weekend. I am surprised that PowerDVD gives you that option but sounds great!